South Korean authorities have identified and requested the revision of 222 cases of incorrect information about the country at 105 homepages of state-run or public organizations in other countries and international bodies, the Ministry of Culture, Sports and Tourism said. The ministry and its affiliate Korea Culture and Information Service said that since July 2017, they have monitored information related to Korea that are on sites run by organizations, including the United Nations, the Organization for Economic Cooperation and Development and the UN Educational, Scientific and Cultural Organization, along with the homepages of embassies, education and foreign ministries of 75 countries. Most of the errors were related to outdated data, with some countries publishing information from five to 10 years ago. The misinformation was more severe in relatively more distant countries like those in Europe or the Arab world. This included stating that English, Chinese, or Japanese are among the official languages of Korea, that the 38th parallel north is the official line dividing South and North Korea, and that hwan or jeon is the currency of South Korea. The 38th parallel north, a circle of latitude 38 degrees north of the equator, had marked the boundary between the territories occupied by the US and the Soviet Union immediately after Japan’s colonial rule ended at the end of World War II. While it is very close to the Military Demarcation Line that exists today, the current border is a little different. Korean is the only official language of South Korea. Hwan and jeon were used before the official currency Korean won -- which was being used with the hwan and jeon at the time -- was instated as the only form of Korean money in the 1960s. As of now, 34 cases have been revised, and KOCIS plans to continue requesting revisions. 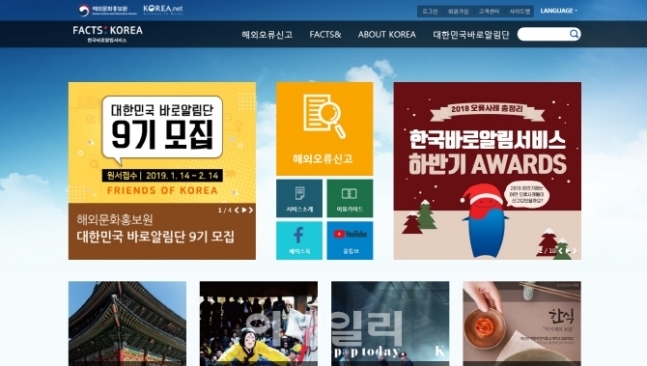 In an effort to promote the country, the KOCIS operates a website called Facts about Korea (www.factsaboutkorea.go.kr) and its mobile application version. Incorrect information about the country can be reported at the website. The aforementioned cases of errors and corrections will also be posted on the site, along with links to the website carrying the correct information in respective cases.